After some hair-pulling session, the Christmas lights are working now. But not without a lot of nagging. My reliable electrician aka atm had to examine 100 lights to see which is the one my toddler pulled out and replaced wrongly. Now, I can switch off the living room lights and sit here blinking my eyes to make my non-blinking lights blinking. 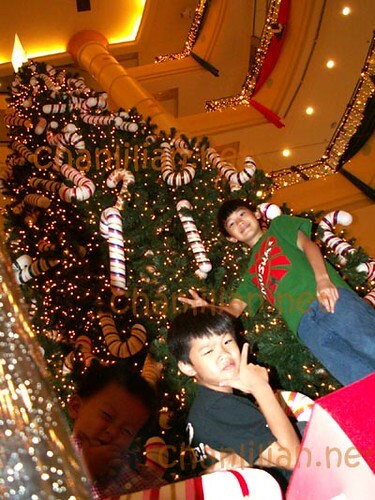 And this is Penang tallest Christmas tree which is loated in Gurney Plaza. They are having a ‘Count the candy canes’ contest. But guess what? If I bring my kids there more often, the candy canes are going to get lesser and lesser. After they broke the canes after using them as as Star Wars Light Saber, tongkat, baseball clubs, wicked witch broomstick…. There is also a photo contest. It is a pretty lame one, actually. 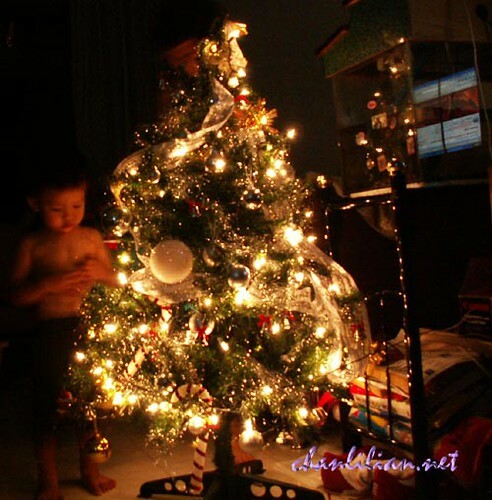 Because they are giving only a miserable RM100 Bodyshop hamper for some ‘best photo taken with the tree’. I bet if I bother to enter, I sure win wan. For Mr Bean’s Johnny English look-alike expressions. I hope my laptop hunt ends there tomorrow. If I am the one making the decision, I would have the laptop on my lap now. But noooooo….my atm has to compare the specs, company stability, country of origin, what will happen in five years time, whether got spare parts and a million other things. We had been to Low Yat, Midvalley, Gurney, One-Stop….. He wanted to get Thinkpad because he said IBM stuffs are reliable. I said I hate a lame brandname like lenovo. He wanted to get Toshiba M40. But I said why spend so much when I can get Dell 630m for a lot cheaper. With 3 years complete cover somemore. So, I gave him the ultimatum. Go to PISA where the PIKOM fair is tomorrow and bring back a laptop by the time I wake up. Or call Dell and get the laptop delivered to me stat. Next Next post: 3 hours at PIKOM & my laptop is here! Walao, pity ur atm, hahaha! Btw, those branded ones should be ok, just compare the specs, price and support, no need bother so much! or else, you will buy a Compaq and place it on his laps for 2 hours! woooweee roasted kkc for supper!!! Let me know what your atm decide. I went to PIKOM PC fair in KLCC yesterday and saw a lot of notebooks. Still dunno which one is suitable for me 🙂 I like IBM but expensive. I agree with the Compaq KKC case. Your atm will also get American breakfast if he use a Twinhead on his lap. The really best deal that I saw was DELL although Toshiba did have some good bargains as well. Bah… my eyes hurt from looking at all the notebooks and my mouth hurt from drooling over all the ultra-slims and tablet PCs. Damn! Bryan – Hahaha, Thinkpad feels rather old to me. So, the finalist was Toshiba M40 but we ditched it for ACER Travelmater 3213.
gbyeow – We met one salesperson who knows how to promote and had a long, long chat. 2 hrs! ahpek – hahaha, American breakfast! CLF – I decided on ACER because I can play some nice RPG mah. What RPG you play leh? I long time no play play liao. Laptop is a good investment, just make sure that quality is guaranteed. BTW, christmas is near. The lights are wonderful christmas are beautiful! Happy Holidays!